After half a year of monthly practice of the Stele of Jeu in different variations I have come to a different understanding of it than when I started. Before beginning to practice the routine I spent several months researching every single bit about this ritual and about the Headless One, which proved quite fruitful in terms of grasping and executing the ritual and the deities addressed. In this post I am briefly revisiting my path with the Headless One, summing up some points of my research and laying out my own conclusions. It will most probably be updated in the future. When I am finished with the number of offerings I have planned to make, at the very end of my homa, I put a coconut into the fire. The coconut represents the worshipper’s head, with its three eyes. Also, it is full of water, just as the head is full of blood, cerebrospinal fluid and glandular secretions. When I offer the coconut I offer my entire consciousness to the fire with a request that it be transmuted into a divine consciousness. I offer my own head to get a divine head. Then I bow to the fire and request my deity to return to His or Her home, and my homa is completed. Then I sit by the fire for a while, after I am finished, and commune with it. "Akephalos" seems to be one of the most controversial deities that appears in the Greek Magical Papyri. He has been identified as quite opposite demons and deities by academia and operative magi. Roughly, the interpretations can be broken down to two different directions: one is the "Typhonian" camp, the other one the "Osirian" camp. In academia the former is represented most prominently by Armand L. Delatte, who claimed to have identified the headless one as being the Egyptian god of the desert, Seth, syncretized with the Greek monstrous demon Typhon (2). The German classical philologist Richard Wünsch follwed this interpretation in his work "Sethian curse tablets of Rome." In magical circles, besides Mathers, The Golden Dawn, Aleister Crowley and the OTO, the prominent contemporary occultist and magician Jake Stratton-Kent delivers more diverse arguments in his booklet "The Headless One" (3) than the other mentioned authors, but comes to the same conclusion. First to challenge this interpretation academically seems to have been Karl Preisendanz, another translator of the PGM, who argued against Delatte and Wünsch in his monograph "Akephalos - The Headless God" (4) (which I summarized here). He argues that the headless god could not be any other than the dismembered and resurrected Egyptian god of the underworld, Osiris. More contemporary scholars of this camp are Reinhold Merkelbach and Maria Totti, who found more supportive evidence of the Osirian character in their "Abrasax" collection of PGM spells (5) through parallels in the phrasing to the Isis Mysteries. Both camps also introduce the Egyptian protector spirit Bes as a witness of their interpretation. Bes is often depicted as a lion rearing up on his hind legs, or as a hairy demon with his face on his chest, which one could interpret as "having no head" with a lot of imagination if one really wants to. The former camp syncretizes this demon with Typhon, the latter underlines his role as the protector of Osiris. In my eyes both ways are completely useless attempts that prove nothing. I've seen many depictions of Bes, and in none of them he appeared even close to being "headless". He was one of the most commonly worshipped spirits by royal as well as common families in Egypt and able to help establish relationships with every other spirit, so it is to no surprise that he appears in many occasions in Greco Egyptian spells, but I doubt any close connection to Akephalos. If I had to choose between the two camps, I would lean more towards the Osirian one, simply because their arguments seem more consistent to me. And in relation to the "Headless Rite" it makes more sense to ritually identify with the god of the underworld in order to gain control over the world of spirits. Oh and yes, Osiris is literally called by his name in the ritual. But to be honest, the more I am practicing the Headless Rite the less I believe the Headless One to be one specific deity or spirit, but an archetype of headlessness itself, with all the symbolism and interpretations it evokes, from loss of orientation to transcendence. In PGM VII 222ff I don't believe Bes has anything to do with headlessness. Yes, he is being conjured and even called "headless one", but I agree with Preisendanz that this is probably an erroneous version of the same spell in PGM VIII 64ff, where Bes is conjured, but with the help of Osiris. PGM II aka. 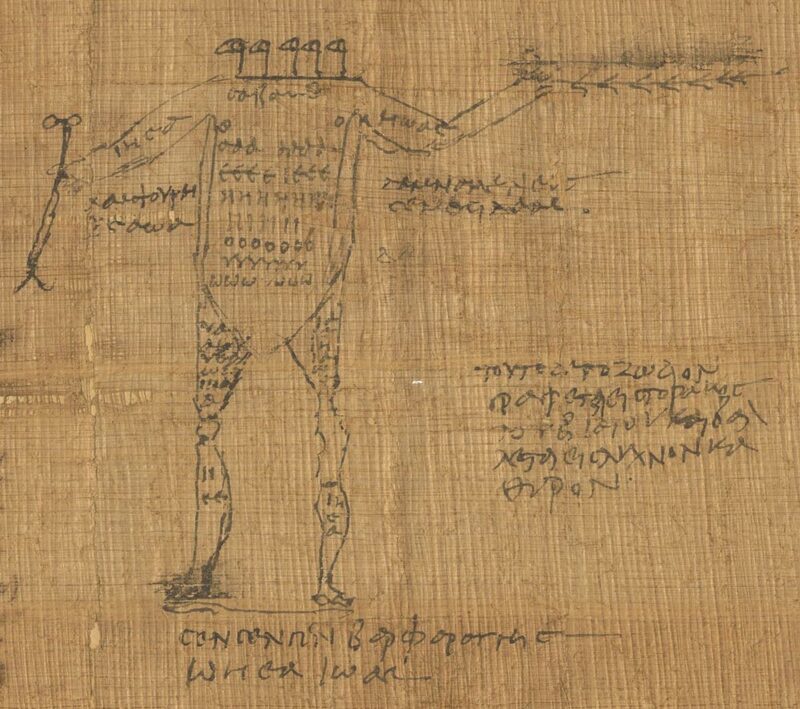 the Berlin Papyrus features this famous drawing of a headless person with the seven sacred vowels written over his chest. The Typhonian camp likes to see "snake heads" coming out of his shoulders as a proof of the Typhonian character of this Akephalos. The Osirian Preisendanz claims that the seven vowels and the magic words "Damnameneus" and "Semesilam" that are written next to the drawing, as well as the scarab drawing on the previous column and the spell itself hint towards a solar deity, a syncretized Helios-Osiris. I think both are over-interpretations of this drawing, because when you read the instructions of the spell this drawing is a part of, it says to "make a lampwick out of a piece of cloth taken from one who has died violently" and the provided image is to be drawn onto this piece of cloth. In the Greek orginal the term "one who has died violently" is "βιαιος". Usually, the spirits of the dead who died violently (βιαιοθανατοι) are considered very powerful. I support Franz Dornseiff in his quite pragmatic explanation that the drawn headless figure is simply a sketch of a decapitated "βιαιος" (6). Also Merkelbach/Totti lean towards this interpretation (5). 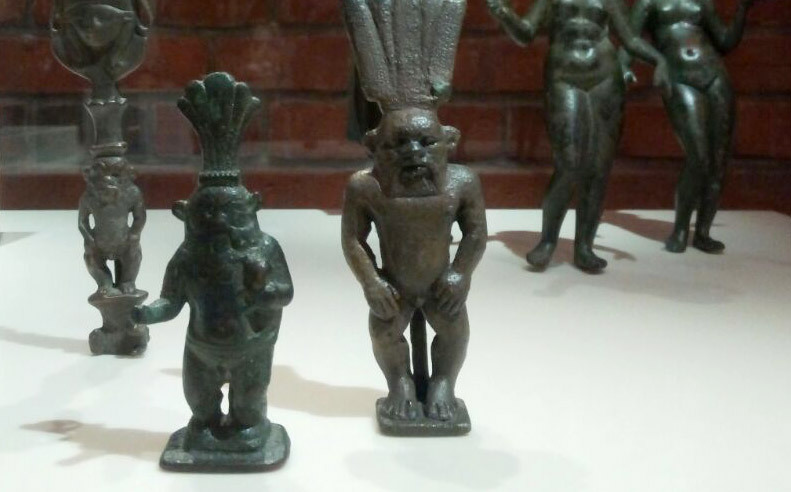 Another possible interpretation is that the depicted headless god is the Egyptian Decan deity "Kenmu" who is most commonly pictured as having no head or his head hidden behind a disk shaped object. Kenmu's Greek name is "Komme" and in lines 117 until 124 the spell calls upon "Kommes" several times, the whole ritual might even be an attempt to bind the Decan god and one of the ways to achieve this is by drawing his picture. In the "Headless Rite" aka. "Stele of Jeu" it is Osiris who is summoned as "the headless one" and "the beautiful Osiris". He is being identified and syncretised with the Jewish desert demon / creator god YHVH. In his forms as Osiris-Ra, and Osiris-Aion he also hints towards the demon Abrasax and the declaration of his name being a "heart girt by a serpent" clearly points to the primordial god Phanes and his other later synthesized mutations as Aion and Mithras. The descriptions in the praises of the text clearly point to Osiris who had put the newly created world into an order of harmonious opposites together with Isis. It also fits the creation process in Genesis. I tried to find the meanings of the barbarous names used in the rite. Some of them are Hebrew (e.g. αρβαθιαω = Arbah Iao = "four of god") voces magicae, some are strings of sacred vowels (e.g. αηωωυ), some sound Egyptiany (e.g. σοχοu) but for most of them I was not able to determine a meaning. It is interesting that by adding the isopsephic values of all subsequent words in the strings of barbarous names and then reducing them ("rule of nine") to single digit numbers, most of them result in 1 or 4. After regular practice, my own understanding of the Stele of Jeu ritual is that it follows a quite transcendental logic and seems to describe an almost Gnostic ascension of the own self towards the Godhead through stages of self-identification with different spiritual forms up to the highest being of the universe. One begins as a human being humbly praying to Osiris, praising his divine achievements and immediately syncretizing him with the Jewish god YHVH as Iabas and Iapôs in the usual pagan way of accepting the gods as gods beyond belief-systems. On the second step the practitioner identifies as an enlightened human, having achieved Gnosis, having become a prophet: Moses as well as a Messenger of Pharaoh Osiris. The third step is a more potent address to the supreme god by using a row of secret barbarous names, to really get his attention. Embedded in more similar subsequent calls is a request to exorcise restraining demons, which is applied to oneself. It's a process of cleansing and purification embedded in magic language of the ancient gods. After being cleared of all demons, in step four one identifies as being an angel of god, taking the form of an invincible, eternal, headless daimon. 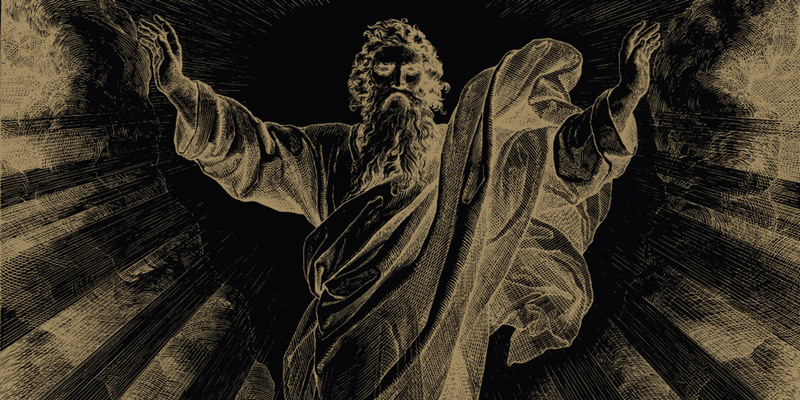 The velocity of the ascent now increases rapidly, as in step five one becomes the truth itself, with clear moral views, one becomes the thundering and lightning wielding Zeus as well as the terrifying and unpredictable god of creation and destruction - raging with a flaming mouth, Yahweh! In the next step the image becomes blurrier and more abstract. 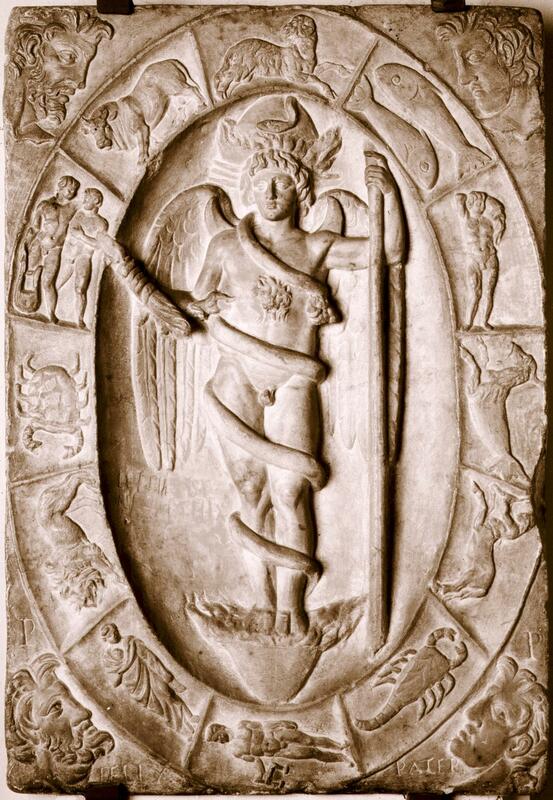 No more identifications with anthropomorphic deities, but a rise up to the level of the symbolic, the Favor of the Aion, your own name having become ineffable and only to be understood as an image: a heart encircled by a serpent. The seventh and final level of ascension to the godhead becomes completely inexpressible and can only be attempted to be described beyond human imagination, by the largest possible magical number of 9,999 expressed in voces magicae and the vibrations of the divine sounds of the seven vowels. Images are transcended to the level of pure resonance, the unified field of consciousness. The ascent is completed and one demands the subjugation of all daimons. From such a perspective that literally includes everything, even gods. After several executions I found myself more drawn to the Egyptian parts in it and faced the consort and sister of Orion, Isis, in her form as Sothis or the star Sirius. But once I had worked out the six names to be used according to the PGM, I started following the orientation in the original text towards North. The difference in power to this ritual was very much noticable and I continued facing this direction until today. As I understand the ritual today I assert that North is the only logical direction on your ascent up. And it's not the magnetic North, it's the celestial North. The visible turning point of the axis mundi, the heart girt by a serpent (the constellation Draco revolves around the polar star). Having experienced the potency of this proceeding I also completely stopped drawing a circle and banishing. It just doesn't fit. I visualize myself and my changing divine position in the universe during each of the seven steps and as the universe revolves around me while I rise up it becomes the magic circle. As I grow in divine potency after my self-exorcism, there's nothing left to banish. I am certain that it is quite a risky ritual that needs to be followed through until the end once started. I think there might be unpredictable consequences if one doesn't complete it or skips parts in it. Sometimes it happens that I stumble pronouncing the barbarous names correctly and to be on the safe side, I usually repeat the whole sentence until it feels right. (3) Stratton-Kent, Jake, "The Headless One. A Guide to the Underworld. ", Hadean Press, Published in June, 2012. 28 pages. (6) Dornseiff, Franz, "Das Alphabet in Mystik und Magie"